Insulin, a hormone secreted by your pancreas, helps control the amount of glucose in your blood. Glucose, also called sugar, is your body's main source of energy. The food you eat is converted to glucose and then driven into your body's cells where it can be used as fuel. Insulin plays a major role in this process. Too little or too much insulin affects the amount of glucose available for fuel. Your pancreas releases insulin in response to elevated levels of glucose in your blood. 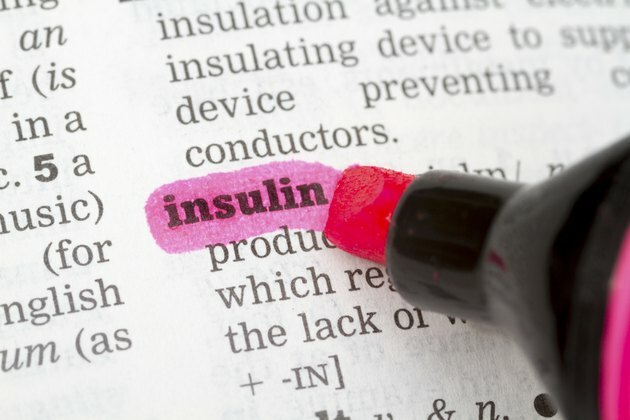 Once insulin reaches the blood, it performs a number of functions, one of which is to facilitate the movement of glucose into muscle cells and fat. There, it is used as energy. It also stimulates the storage of excess glucose as glycogen in muscles and in the liver. Insulin also stops your liver's production of glucose, which is a process called gluconeogenesis, which serves as an important source of energy when you fast. When your insulin level is too high, your blood glucose level may drop to a dangerously low level--a state called hypoglycemia. This is the most important consequence of too much insulin. The American Diabetes Association defines hypoglycemia as a glucose reading less than or equal to 70 mg/dL. Hypoglycemia occurs as a result of insulin increasing the uptake of glucose by your body's cells, blocking gluconeogenesis and increasing the storage of glucose in the liver and muscle. However, if you don't have diabetes and your pancreas functions as it should, it will release a hormone called glucagon to counteract the effects of insulin. Hypoglycemia is an acute complication of diabetes. It may be mild, moderate or severe. Symptoms include fatigue, weakness, confusion, headache, irritability, personality changes, shakiness, dizziness, trouble concentrating, slurred speech, hunger, nausea, rapid breathing, sweating and unconsciousness. If you are a long-time diabetic, you may not notice these symptoms. This is called hypoglycemic unawareness. If you don't have diabetes, your body will not secrete more insulin than it needs. But if you are diabetic, you may experience excessive amounts of insulin when you take more than your prescribed dose of insulin medication or when you take a dose and fail to eat enough to cover it. Exercising heavily may also contribute to an excessive amount of insulin. Taking diabetes pills called secretagogues--glipizide, glimepiride, glucotrol, chlorpropamide, repaglinide and nateglinide--may also lead to excessive amounts of insulin. These agents stimulate the release of insulin from your pancreas. Failing to eat, or engaging in physical activity after taking these medications, results in high amounts of insulin in your bloodstream. This may lead to the development of hypoglycemia. Treatment of low blood sugar involves raising your glucose and counteracting the effects of insulin. One way to increase your glucose level is to eat or drink something with sugar. Examples include fruit juices, soft drinks or hard candy. As an alternative, take glucose tablets or gel, which are sold over the counter. Glucagon injections are used to counter the effects of insulin. Glucagon also works fast, but requires a prescription from your doctor.